"I enjoy government functions like I enjoy getting kicked in the nuggets with a steel toed boot. But this hotel always served bacon wrapped shrimp. That's my number one favorite food wrapped around my number three favorite food. I'd go to a banquet in honor of those Somali pirates if they served bacon wrapped shrimp." With Summer starting to kick up the heat, it's time to fire up the grill. In my opinion, there is no better way to celebrate the season than with delicious food, family, and good times. It was with this philosophy that I set about writing my cookbook, and, a year after it's release, I've determined which recipes were the biggest hit with fans. All the recipes featured in Paleo Grilling cookbook, Poppin' Shrimp is probably the one I hear about the most and it's definitely the one I personally make the most frequently. It's always a crowd pleaser and I never get tired of the combination of hot, sweet, salty, and savory flavors. 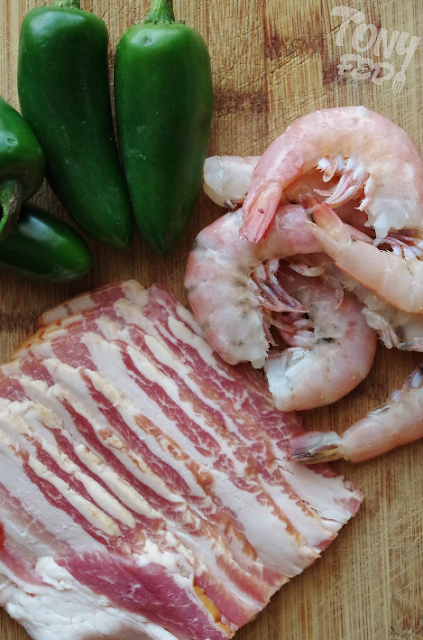 I typically start with locally caught Mayport shrimp, and, after peeling, and deveining them, I lay a slice of fresh jalapeno pepper into the groove. I then take a slice of high quality cured pork belly (aka bacon) and wrap the whole thing tight. While these little morsels pack a lot of flavor on their own, I like dusting them with fiery spices to give the gustatory experience more complexity. I hope you try this recipe and if you do, don't forget to use the #paleogrilling hashtag so I can check out your results! Lightly dust the prepared shrimp in the spice mixture. Working with one shrimp at a time, make a slit about 3/4 inch along the base of the shrimp. 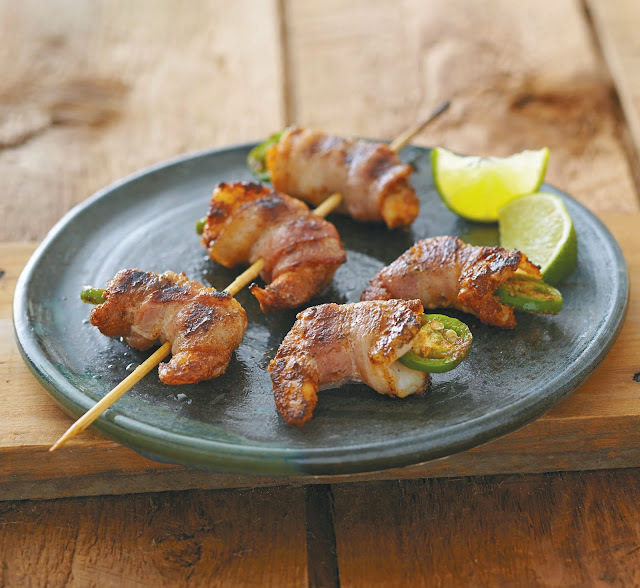 Place 1 jalapeno slice in the slit, then wrap tight with a slice of bacon. 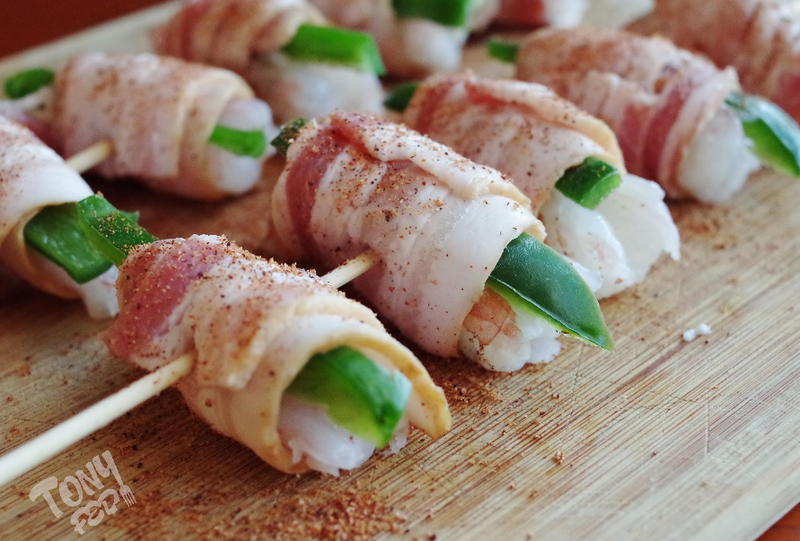 Thread the shrimp onto the skewer, trying to spear the jalepeno slice as well as both ends of the bacon. Repeat this process until you have 4-5 shrimp on each skewer. Dust again with spice mixture and set aside. Prepare your coals by rolling a sheet of newspaper into a tube. Bend the tube into a doughnut shape and stuff into the base of your chimney starter. Place the starter on the grate of your grill and fill with charcoal. Using a grill lighter, light the newspaper. When the coals catch, they will take about 10-15 minutes to properly light. You'll know that they're ready when the top layer of coals starts to become white with ash. Carefully dump the hot coals into the base of your grill and replace the grill grate. Brush the grate to remove any bits of ash that remained from the chimney starter. 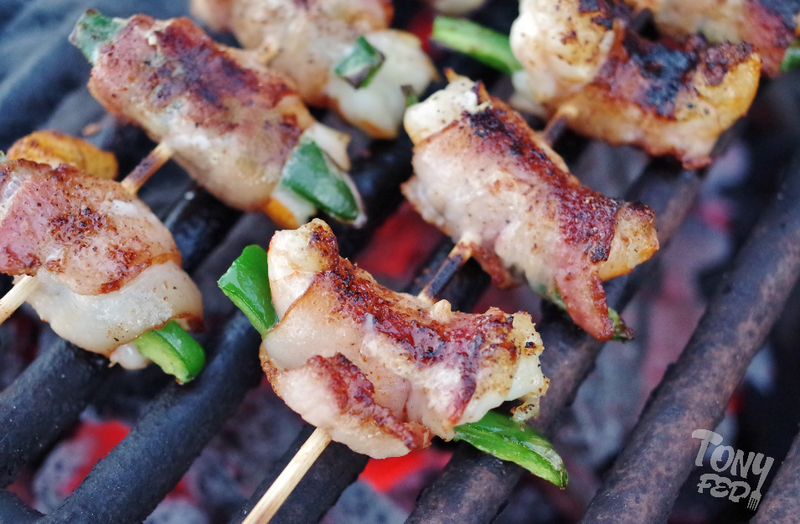 Place the shrimp skewers on the grill directly over the coals and cook until the bacon crisps, ~3-5 minutes per side. Note: You may wish to brush the skewers with a small amount of tallow, ghee, or coconut oil to keep them from sticking. When the shrimp are done, serve either on or off the skewer and garnish with lime. Image from: "Paleo Grilling: A Modern Caveman's Guide to Cooking with Fire"